The user's Autoresponder tab defines autoresponders for this user. An autoresponder is an email which is automatically sent when a message arrives in a user's mailbox. It is important to note that autoresponders will only trigger if a message actually arrives in a user's mailbox. If Mappings or forwards mean that the message gets delivered elsewhere, then the autoresponder will not trigger even if it was originally addressed to this user. In VPOP3, there are Autoresponder Rules and Autoresponders themselves. 1.The Header Filters are checked. If the incoming message header matches the Header Filters, then no autoresponder is triggered. 2.The Header Triggers are checked. If there are no Header Triggers or the incoming message header matches the Header Triggers, then VPOP3 continues to step 3. Otherwise no autoresponder is triggered. 3.The Autoresponder Rules are checked one at a time. if the incoming message and date/time match an autoresponder Rule, then the autoresponder associated with that Rule is triggered and the processing stops. Otherwise the next Rule is checked until one matches or all the Rules have been checked. 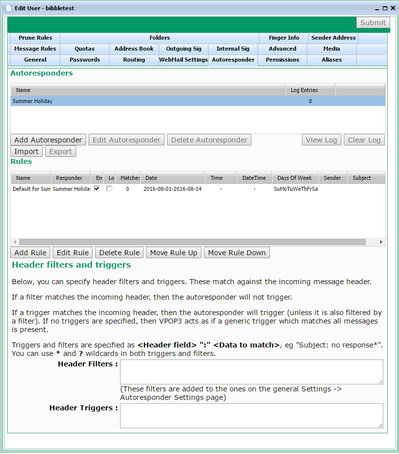 The Autoresponders section defines autoresponder messages & actions when an Autoresponder Rule is triggered. You can add, edit and delete Autoresponders by pressing the Add Autoresponder, Edit Autoresponder and Delete Autoresponder buttons respectively. You can also edit an Autoresponder by double-clicking it in the list. Each time an Autoresponder is triggered, VPOP3 logs this. You can view the log for an autoresponder by selecting it and pressing the View Log button. You can clear the log by pressing the Clear Log button. (Entries are automatically deleted from the log after 180 days or when the Autoresponder definition is deleted). The Export button exports the selected Autoresponder definition to a file, and you can re-import it later by using the Import button. The Autoresponder Rules section defines Autoresponder Rules which tell VPOP3 what the conditions are for triggering autoresponders. The Rules list is ordered - VPOP3 will check it from top to bottom until it finds a rule which matches, and then it won't check any further rules. You can add, edit and delete Autoresponder Rules by pressing the Add Rule, Edit Rule and Delete Rule buttons respectively. You can also edit an Autoresponder Rule by double-clicking it in the list. You can re-order Rules by selecting them and pressing the Move Rule Up and Move Rule Down buttons. If a Rule is greyed out in the list, then it means that it is not enabled, so VPOP3 will ignore it when checking for matching Rules. 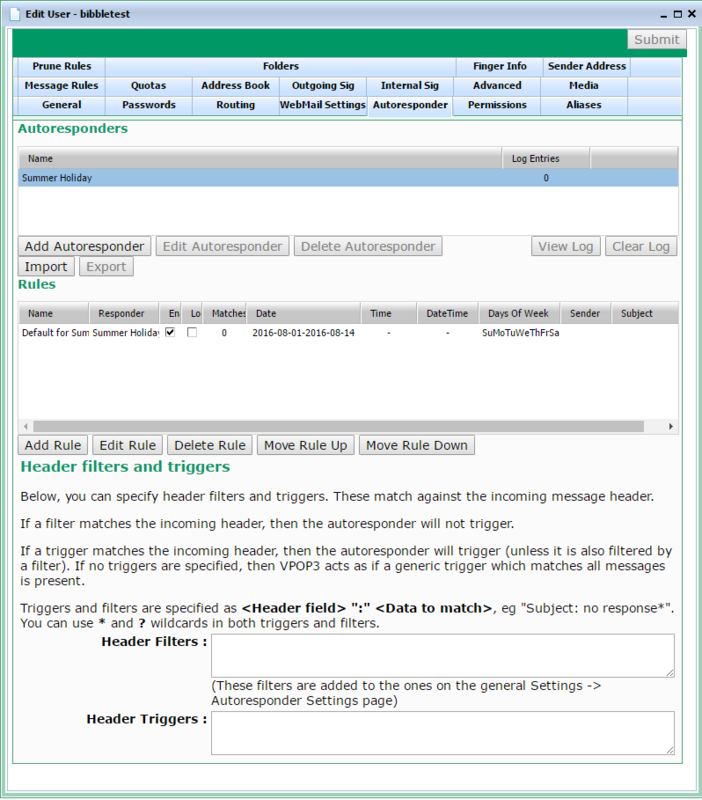 Autoresponder Header Filters and Triggers let you tell VPOP3 when autoresponders will or will not be used. These are checked before the Autoresponder Rules so will affect all Autoresponders for this user. You can also global autoresponder filters in Settings -> Autoresponder Settings which apply to all VPOP3 users. For example: Subject: NoReply* looks for the Subject: line in the message header and checks if the data for that header field begins with NoReply. VPOP3 does a case-insensitive check and allows wildcards. The Header Triggers box lets you specify data to look for in the message header of the incoming message. If any headers match, then the autoreponse will be triggered, If there are no Triggers defined, then VPOP3 will act as if a generic trigger matched. For example: From: *@customer.com* looks for the From: line in the message header and checks if the data for that header field contains @customer.com. VPOP3 does a case-insensitive check and allows wildcards. Put each filter or trigger condition on a line of its own. If any of the list of conditions match, then VPOP3 treats that section as matched. Also be aware that the filter & trigger conditions have to match exactly (with wildcard checking and case insensitivity). then it will not match, because you have told VPOP3 that it has to exactly match joe@customer.com. Use wildcards if you want to test for text being included in the header line. Note that in most cases, it is best to leave the Filters & Triggers fields blank and use Autoresponder Rules instead.